We’ve held regular playtests of the realtime dogfighting module over the last year, as we tweaked and optimised the combat netcode and physics engine. All that work - the most critical layer to get right - is now finished! We’ve now moved on to the core components of the rest of the MMO experience, including trade/industry and missions; wrapped up in these tasks are a variety of necessary items ranging from NPC AI & 3D pathfinding algorithms to the new, full UI, incorporating build-your-own cockpit multi-device support. don’t forget to sign up to our mailing list (don’t worry, we won’t spam you! ), and read on! No download or install: it runs in your browser without plugins! There’s a lot to share about our plans for Age of Ascent, so please read on! We firmly believe in listening to our community, we’re going to continuously update the project as it grows and we need your feedback and ideas. We’re going to offer 8 initial ship hull classes: explorers, transports, industrial, cutters, scouts, frigates, cruisers, destroyers. Each of these ship hull classes will offer different slot options from different manufacturing blueprints, and will be fully customisable in terms of the modules that you want to put in the slots. Slots fall into 5 categories – Offensive (projected), Defensive (internal), Utility (a variety of types such as sensors), Engineering (engines and damage control) and Software (scripts to further modify behaviors, or to replay, e.g. formation evasive manuevers). The modules that can be put into these slots will depend on the skill level of the pilot (or pilots if more than one is operating different parts of the same ship) as well as the size fitting and power requirements of the module. 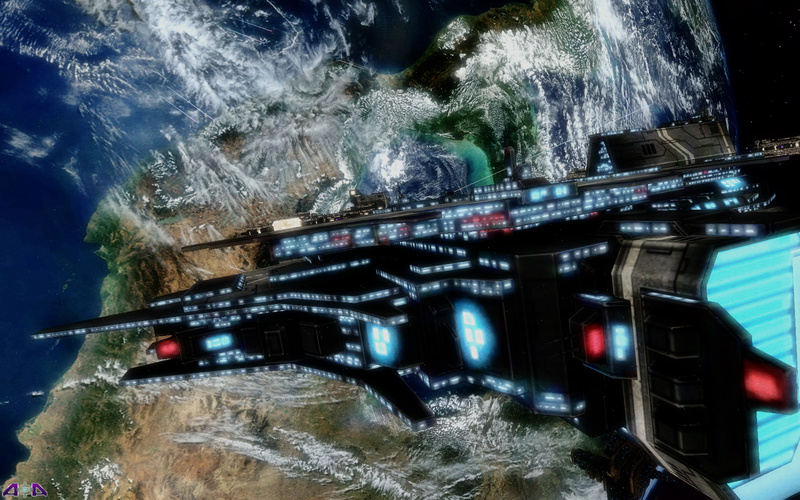 We plan on having capital ships – carriers and ships of the line – that require crew to fly. 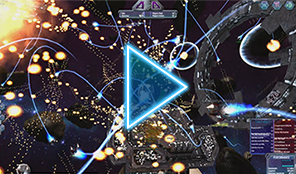 Crew will initially come from specially skilled NPCs, but as an early stretch goal we will allow multiple players to fly the same capital ship simultaneously, occupying different positions and working together, acting in positions such as skipper, navigator, shields and damage control, engineering and power, weapons systems, manning turrets and so on. We think anyone should be able to jump into a ship and contribute. We also think pilots should be rewarded for working together and for taking the time to develop their skills. So we’re aiming for classes of ships that will never be obsolete in large engagements, and that will allow for anyone and everyone to make a difference without necessarily losing a year’s worth of investment. We’ll encourage you to put your goodies at risk and the rewards will be worth it, but with a system that can allow thousands of players to fight simultaneously, we’ll also be providing every incentive for you to jump in your cockpit and get involved – whatever your skill level. A player-led economy is crucial to us, but the NPC areas of our galaxy are also alive, and these zones will respond to your actions, be they trading, raiding or construction. We want to develop a full multi-stage production process cycle, from gathering resources and refining them and putting them through different processes to create components. These components are then assembled to make modules, ships, spacestation structures etc. The number of stages of the manufacturing process will depend on the complexity of the blueprint for the final product, while success will rely on having the right tools and facilities. Be careful though, in the core zones, some of the Great Powers won’t just let you research or build whatever you want, they’ll want their cut. Last, but not least, resources: they won’t renew. You may find a system where it takes two years to mine all the goodies, but once they’re gone they’re gone. We want you out there exploring, being surprised and settling ever further from home. Whenever we replay our favourite classic strategy games (like Civ or Alpha Centauri), we’ve found that we tended to always have the most fun in the first couple of hundred turns. Exploring a new area, finding out the challenges that lie before you, where to go next and choosing which grand strategy to implement depends on properly understanding access to resources, strategic chokepoints and nodes of focus. We want to recapture that sense of a journey into the unknown, a journey that rewards the bold and the smart. Skills will break in a number of areas from piloting and weaponry skills, to trade and manufacturing skills, to exploration skills, to alliance management skills and beyond. The skills that a player develops for his pilot will be partly elective, time-based skills that accumulate over time, depending on where a player chooses to focus his or her learning… and partly based on the player’s actual activity, ingame. We need the former in place to balance out ‘botting, and also to help ensure that there’s no “pay-to-win”. People who play Age of Ascent for longer will become more skilled in the areas they focus on. Players also should have more opportunity to branch out, even though we are intensely focused on making the game accessible to anyone who wants to pick up and play. For us, the successful balance will be to provide a game which allows you to contribute and achieve from day one but that opens up new vistas of possibilities for those who build out their presence over time. We know that not everyone wants to PvP. And that’s fine with us. Age of Ascent isn’t about dictating a play style that people have to conform to; it’s about providing all the options players need to play the kind of game they want. The core systems, of which there will be many hundreds, (or thousands depending on stretch goals!) are run by a variety of old-Earth geopolitical and ideological factions which have carved out their own empires in the vastness of the galaxy – and if you stay on their right side, they’ll try and keep you safe and, just maybe, they’ll offer you technologies and trades you won’t see elsewhere. Space in Age of Ascent is so large, that if playing with or working for others isn’t your thing, then there’s every chance to get out to a part of the galaxy that’s entirely your own, far from the crowd, and disappear for years. These NPC Factions will offer multi-threaded, multi-outcome missions. We feel the linear, pretty much identical, rinse-repeat quest/mission gets tedious very quickly, and we want to build mission systems that can change dynamically, according to local circumstances and which can have the scope to change entire regions of space depending on what players do and how our AIs respond to that activity. We won’t be re-spawning the same ships a hundred times, our AIs are going to see what you’re doing and react. Outside of missions, the NPCs in universe of Age of Ascent will run on emergent behavior systems rather than orthodox scripting, and there’ll be plenty of opportunity to interact with them as you go about your day-to-day business – be that helping them or “hindering” them as you choose. We believe player-run alliances and clans should offer all the flexibility serious alliances have come to expect from MMOs. This means internal comms channels and forums, roles and titles, permissions, hangars, wallets, voting rights and shareholdings, limits, checks and balances. At a collaborative level, we have to cater for every way an alliance wants to operate – as a leadership council, a democracy, a dictatorship or an anarchy. As the gameworld we’re building is based on the real galaxy, there’s going to be a lot of space. 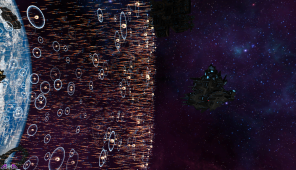 We want players and alliances to fill that space themselves, with their own – modularly designed – space stations, jumpgate networks, trade-lanes, weapons platforms, manufacturing and mining centres, minefields, and every single thing that the pre-designed NPC zones of control has in them. So if you want to charge people to dock at your station or use your trade-lane, or collect taxes on transactions conducted by players in your alliance’s space, or build a tournament arena and run your own combat – or racing – league… go for it! 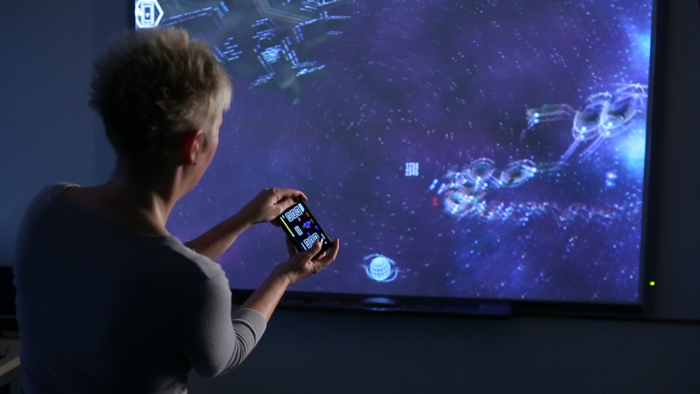 We’ve already demo’d using a phone to control ship flight (and here’s a sneak preview!) 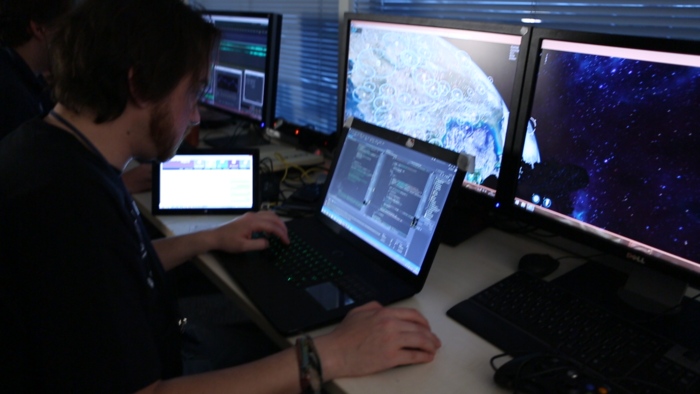 We love the idea of allowing players to build their own cockpit with multiple devices working in tandem. So you can have the front view out of your spaceship on your big screen, a Surface tablet next to you showing your local radar and navigation maps, an iPad giving the latest market prices for your sector, and your phone flying the ship. If that’s what you want, that’s what you should be able to do! Click here to watch a recent PvP test! Stay in touch with what we're building! The title Age of Ascent references humankind’s ascent into the heavens in the year 2176. Faster-than-light travel and communications have been achieved. We’re using the real Milky Way star catalog and as much real science as we possibly can. To realise this goal we’re working closely with the professional space community to map out the milky way, develop a plausible future history and technologies that make sense. If you’re interested in getting an idea of what playing Age of Ascent will feel like, check out some of the short stories by our keeper-of-the-backstory-in-residence, Stewart Hotston. Illyriad Games is small, 7-year old UK-based indie game company, making deep and epic MMO games in HTML5. We believe MMO games should be epic, persistent and truly massive, and that doing this in a web browser isn't impossible. We believe everyone should be able to play for free, but that pay-to-win is self-defeating for everyone involved. Even the journalists agree that we've got the balance right with our last title! We love hearing from people – as a small indie games company, communication is key to our success! If you're a member of the press, please email our press account.